Got a nice email from Ben over at The Launch Box the other day and realized I never posted this one here. 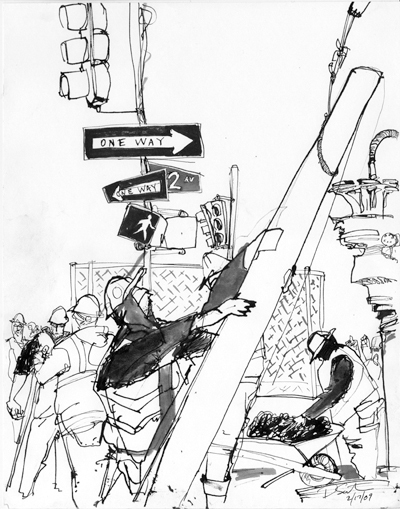 It was the image of the day two weeks ago on Studio 1482s One Drawing A Day site that we started in June. Thanks to HOW for giving us a little mention this week, it is always appreciated. This drawing is from February. It wasn’t inauguration day cold that day but it was cold and I remember being very grateful that I had my job and these guys had theirs. As is the case every 8-9 months I am not sure what is in store for the Second Avenue Subway line (I really have been out of the loop in many ways, as Ben made me realize as he updated me on the local building problems and the expansion of the work), but I think if construction gets shut down (again) we can successfully say that any attempts to resurrect the idea should be met with a swift kick in the arse. I hope, for all the East siders as well as the businesses that have had to suffer due to the noise and disruption, that at the very least they have a new crowd of customers and friends coming and going in five or ten years as is now expected. I watched as a pipe was drilled into the center of 94th street and brown liquid just pumped out of the pavement. It seemed expected as two or three guys swept right in to push the brown water back towards the hole in the ground and waited until another extension was put on the drill. The entire scene was seemless, each person doing their task as the next either took a break or prepared for their next hurried task. Not sure how many times they added an extension or how deep they went, but I think the East River sank a foot that day.